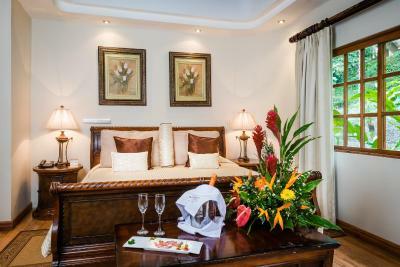 Lock in a great price for Borinquen Mountain Resort & Spa – rated 8.3 by recent guests! The eucalyptus natural steam room, mud pots and fumaroles were amazing. The grounds and pool are beautiful. Breakfasts and lunch were good with good service. Dinners were mediocre with non existent service. 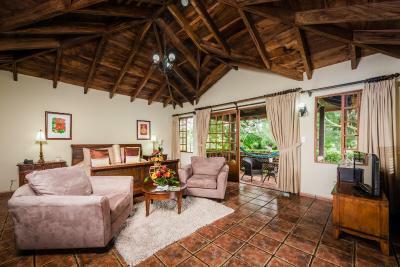 Beautiful property in a secluded hideaway, with hot-springs, pools and waterfalls. The staff is so lovely seriously. 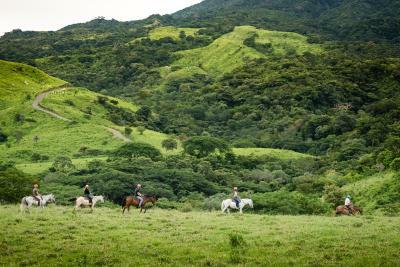 They have great zip lining and horseback riding and the staff was awesome so incredibly patient. The pool bar guy was so sweet. It’s in a beautiful setting although the steep hills would be tough for some people. We had a few issues with our room and the staff upgraded us to a suite! It was four times the size of our villa and absolutely gorgeous. The pools, sauna, and mud baths were great. We loved the resort. The Christmas décor was a nice touch. Absolutely stunning! Everything exceeded our expectations. Great customer service, they really go above and beyond here. 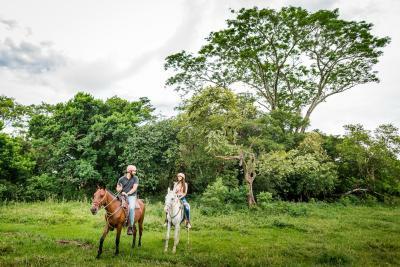 They offer lots of great tours, horseback riding, zip lining, spa, mud baths, thermal waters, steam rooms, a beautiful swimming pool, trails..... the zip lining tour was incredible! 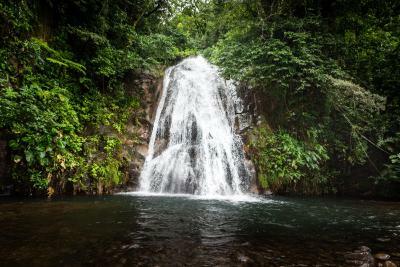 Rincon de la vieja Park is about 50 minutes away and totally worth the visit. Make sure you have GPS/phone service and a full tank of gas :) the area here is very rural and the closest gas station is in Liberia! The property was stunning. Beautiful mountain paradise. Absolutely fabulous all facilities and service. Personel are so friendly and helpful. Entire property is like rainforest heaven. The cabins, location and facilities were absolutely beautiful. Definitely, a little piece of paradise. We loved watching the monkeys and toucans while we lounged at the hot springs! 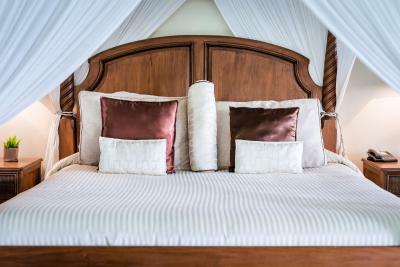 Borinquen Mountain Resort & Spa This rating is a reflection of how the property compares to the industry standard when it comes to price, facilities and services available. It's based on a self-evaluation by the property. Use this rating to help choose your stay! 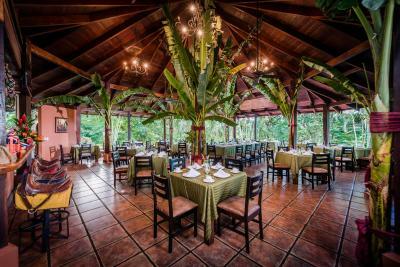 Borinquen Mountain Resort & Spa is located in Rincon de la Vieja. 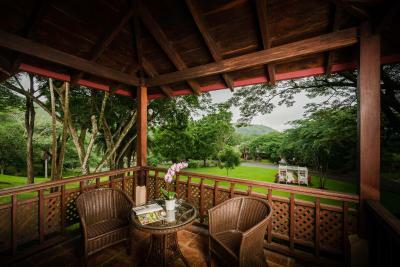 If features Spanish-rustic décor villas, bungalows and Junior Suites, each of them featuring a private balcony with mountain views. 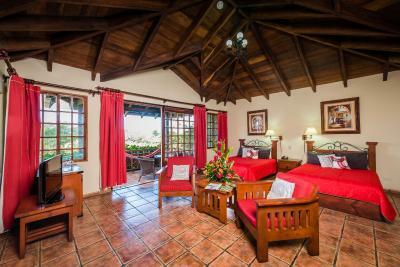 All rooms at Borinquen Resort are air-conditioned and offer private bathrooms with a hairdryer, satellite TV, mini-bar and coffee maker. 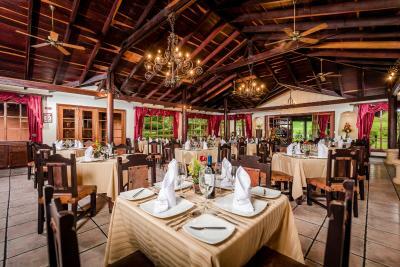 Borinquen Mountain Resort & Spa features a lagoon-style, outdoor swimming pool and 2 restaurants serving national and international cuisine. There is a snack bar and a swim-up bar where guests can relax and enjoy great food and refreshing drinks. 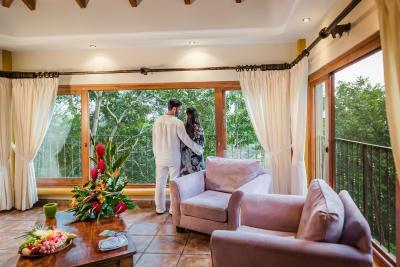 Guests can also visit the Anáhuac Spa which offers 3 massage rooms overlooking the river and the forest. The area is ideal for hiking and other adventure activities. 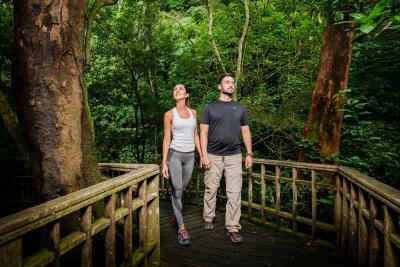 Discover rare species of birds, monkeys and other fauna. 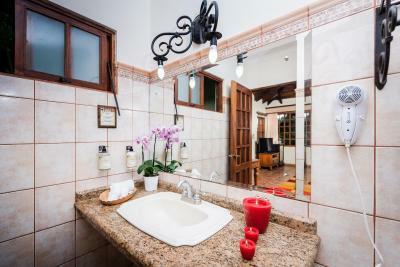 You will also find thermal spring water pools, volcanic mineral mud and a natural steam-room. Daniel Oduber International Airport (LIR) is 29 mi from the resort. 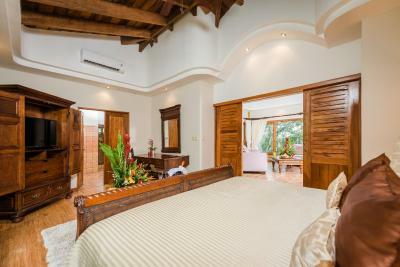 This property also has one of the top-rated locations in Pital! Guests are happier about it compared to other properties in the area. This property is also rated for the best value in Pital! Guests are getting more for their money when compared to other properties in this city. 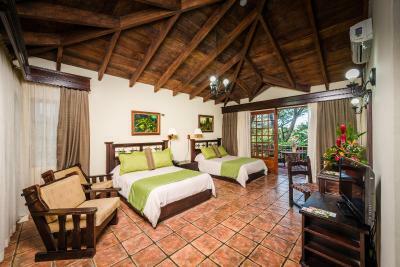 When would you like to stay at Borinquen Mountain Resort & Spa? 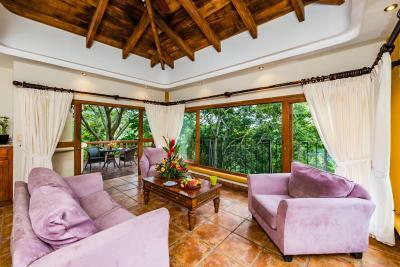 This air-conditioned bungalow offers a covered porch with fantastic garden and mountain views. It has 2 double beds, seating area, satellite TV and a coffee maker, mini-bar and a safe. 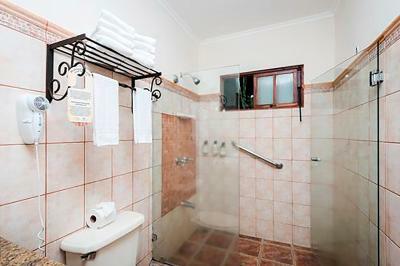 There is also a private bathroom with shower, hairdryer and bath amenities. 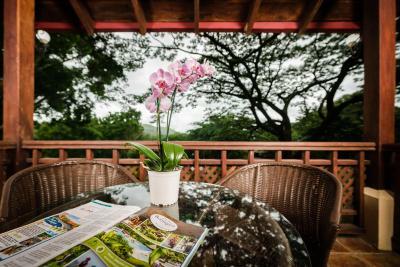 This spacious and stylish air-conditioned Superior Bungalow has a covered balcony with fantastic mountain views and comfortable hammocks. It has one king size bed, a sitting area, satellite TV and a coffee maker. There is also a private bathroom. 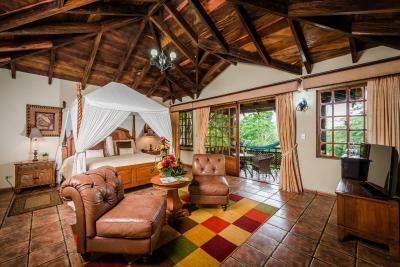 This comfortable and luxurious air-conditioned Junior Suite has a wood deck with stunning views of the valley. There is also a sitting area, satellite TV, coffee maker and a private bathroom. 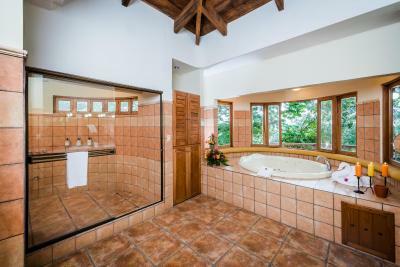 House Rules Borinquen Mountain Resort & Spa takes special requests – add in the next step! Borinquen Mountain Resort &amp; Spa accepts these cards and reserves the right to temporarily hold an amount prior to arrival. Borinquen Mountain Resort & Spa accepts these cards and reserves the right to temporarily hold an amount prior to arrival. Special dinner, live music. This will be the only dinner option we will have this day, please notify special menu such as vegetarian or allergies if applicable. A New Year’s celebration that includes special dinner, live music, fireworks and champagne toast will be hosted. This will be the only dinner option we will have this day, please notify special menu such as vegetarian or allergies if applicable. The bungalow we were ‘upgraded to’ was a bit tired but comfortable enough. It was a quiet setting in the mountains. The road to the property was in bad shape - you need a 4x4. The pool and SPA also - they need a renovation. My evaluation meets my expectations, because we did not use them. The bungalows were nice and clean. It’s a bit far from other activities, but good if you want to get away from it all. There was very little to do after the evening meal. A bar would have been welcome. Also no WIFI in the room was a slight irritation. Great Staff, fantastic location. Lots of trips on offer and plenty of wildlife close to the hotel. The staff is so friendly and go out of their way to make you feel welcome and provide anything you could want or need. 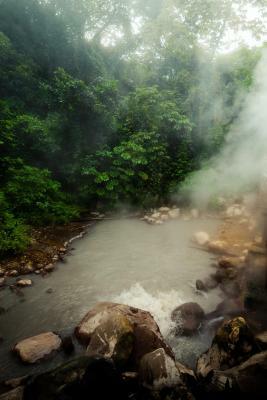 Such a beautiful natural setting to experience mountain hot springs, mud baths, a wooden sauna in the jungle in which steam rises up through the floor from a boiling volcanic stream beneath. So unique! Gorgeous pool to cool off in and Luis makes the best Pina Coladas at the swim-up bar. 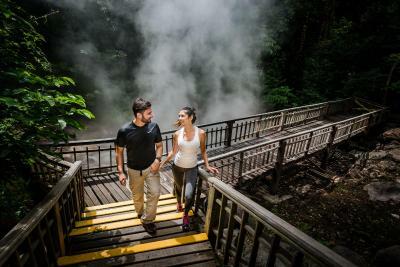 A massage at the spa suspended over a rushing river in the jungle was amazing, and the mud bath followed by a walk on beautiful forest and river trails was the most relaxing way to experience this volcanic area. 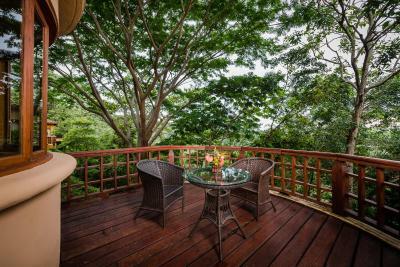 We were generously upgraded to a Junior Suite which was so spacious, private, and with the best treetop views over the valley to the ocean for perfect sunsets on our private balcony. TV hard to figure out how to watch English channels. All else was great. Before you come up make sure you stop at the supermarket and buy your snacks, sodas and things you like to eat because theres nothing up there, the nearest town is like 30 mins away and if you don’t have a car its difficult to get there, there sodas, water and food are not that cheap, there food is good, BUT my daughter ended up getting food poisoning from eating the steak and there is no way to call reception to bring cleaning products, toilet paper etc because there phone doesn’t link you to an employee its only for long distance calls. After it gets dark around 6pm in Feb theres nothing to do, i wish they had more night activities, overall i would go again but will not be eating any meats. They do need to update there rooms though, maybe add some bottled water in the rooms, more toilet paper, tissue paper for when the staff is not available.